A rare find with the original bakelite box, this Gruen Curvex is a sought after model. Its hard enough to find clean examples of original Gruen Curvex watches, but this stunning example come with the original bakelite box. 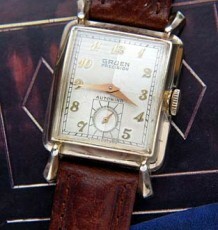 The Gruen Curvex is one of the most popular and sought after vintage watches on the market. The long curved gold-filled case is signed Gruen and Wadsworth 14kt gold filled. 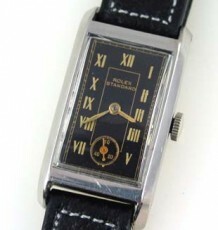 It is in excellent condition with no visible wear though or other damage to the case. The 17 jewel manual wind Gruen precision calibre movement 330 was just cleaned and serviced by my watchmaker and is keeping great time. The dial features raised gold toned Arabic numerals against an off-white background. 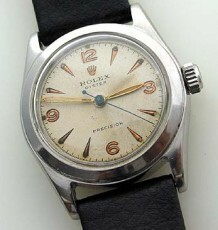 The watch also has the desirable sub-seconds register in the lower half of the dial. The curved case measures 20 mm wide by 41 mm long and is supplied on the period correct gold toned flexible expansion bracelet. 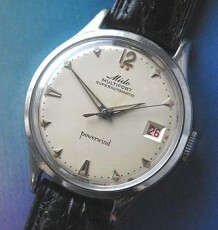 A leather strap can fitted in its place.